Join us to hear from three practitioners speak on the subject of Permaculture, enjoy lunch with locally grown food and earn one hour of HSW credit while considering how you might incorporate more resilient practices in site design. Dave Edwards is the former Division Head of Agriculture Technologies at Oklahoma State University / Oklahoma City. He has worked with students, educators, business leaders, employees, homeowners and horticulture enthusiasts – promoting the field of horticulture and many aspects of the green industry. He retired from the OSU system in 2013, but continues to teach part-time as a Professor of Practice at the University of Oklahoma in the Landscape Architecture Division in the College of Architecture. Dave is a registered Landscape Architect in the state of Oklahoma, and has worked as an administrator, educator, landscape architect, design/build contractor, and other roles in the green industry for over 40 years. Paul Mays is currently Director of Permaculture at SixTwelve, a non-profit organization, in Oklahoma City’s Paseo Arts district, that focuses on community education based on the arts and sustainability. Mays works with Pre-K and After School students and teaches and curates monthly workshops focused on topics including Inviting Water into the Landscape, Fungi Cultivation, How to Garden, Food Forestry, Plants as Medicine Reskilling, and Food Preservation. Mays is also co-founder of the Paseo Farmers Market. At the heart of all his work, is the importance of local food security and creating a diverse community through both ecological and social perspectives. Register below to attend the AIACOC Committee on the Environment Luncheon on Thursday, April 11th. The cost to attend is $20. No refunds after Friday, April 5th. The deadline to register is Friday, April 5th. A big thank you to Nabholz Construction for hosting the us! 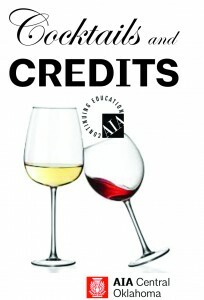 Want to provide a Cocktails & Credits program in 2019? FIND MORE COURSES AT AIAU!